Findagrave.com, memorial #22550482. Photo by Nareen et al. [S185] Concord, Massachusetts Births, Marriages, and Deaths, 1635–1850, 34, Dorothy Brookes b. [S185] Concord BMD, 65, Joseph Miriam/Dorothy Brookes m.
[S185] Concord BMD, 171, Joseph Meriam d.
[S185] Concord BMD, 184, Mr. John Hunt/Mrs. 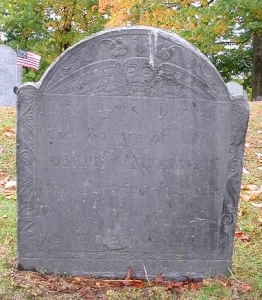 Dorothy Meriam m.
[S185] Concord BMD, 206, John Hunt d.
[S820] Charles Henry Pope, Merriam Genealogy, 56, Joseph (19.) Merriam. [S148] FindAGrave.com, memorials #22551350, #22550482. [S2363] Concord Gravemarker Data, OHBG-536, Mrs. Dorothy Hunt; OHBG-537, Mr. Joseph Meriam. [S2363] Concord Gravemarker Data, OHBG-536, Mrs. Dorothy Hunt. [S185] Concord BMD, 65, Dorothy Miriam b. [S185] Concord BMD, 68, Mary Miryam b. [S185] Concord BMD, 73, Joseph Miriam b. [S185] Concord BMD, 80, Samuel mirriam b. [S185] Concord BMD, 99, Nathan Meriam b. [S185] Concord BMD, 115, Josiah Merriam b.
Findagrave.com, memorial #22551350. Photo by Nareen et al. [S185] Concord, Massachusetts Births, Marriages, and Deaths, 1635–1850, 20, Joseph Meriam b. The inscribed date of death is incorrect, as his will was proved two weeks earlier. Courtesy Farber Gravestone Collection. 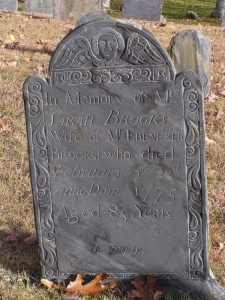 Ebenezer's widow Sarah died 22 Feb 1775, a. 84.9 They are buried in Oak Street Burial Ground.10,11 Of their eight children, two married Willard siblings and two married Drury siblings. [S185] Concord, Massachusetts Births, Marriages, and Deaths, 1635–1850, 34, Ebenezer Brookes b. [S185] Concord BMD, 89, Ebenezer Brooks/Sarah ffletcher m.
[S1491] Gertrude I. Knowlton, "The Brooks Family," 6. [S2041] Frederick Clifton Pierce, History of Grafton, Worcester County, Massachusetts, 65-67. [S1491] Knowlton, "The Brooks Family," 8. [S2041] Pierce, Hist. Grafton, 412, 417. [S239] Franklin P. Rice, Vital Records of Grafton, Massachusetts, To the end of the year 1849, 324, Ebenezer Brooks d. (g.s.). [S590] Worcester County Registry of Deeds, Ebenezer Brooks, Grafton, 14-10-83, trans. Christopher Brooks. [S239] Grafton VR, 325, Sarah Brooks d. (g.s.). [S1418] The Farber Gravestone Collection. [S148] FindAGrave.com, memorials #27560001, 27560002. [S1491] Knowlton, "The Brooks Family," 7-8. [S2041] Pierce, Hist. Grafton, 401. [S1491] Knowlton, "The Brooks Family," 6, quoted. [S1491] Knowlton, "The Brooks Family," 7. [S185] Concord BMD, 86, Noah Brooks b. [S185] Concord BMD, 91, Sarah Brooks b. [S185] Concord BMD, 99, Joel Brooks b. [S185] Concord BMD, 105, Simon Brooks b. [S185] Concord BMD, 112, Mary Brooks b. [S185] Concord BMD, 118, Peter Brooks b. [S185] Concord BMD, 129, Elisabeth Brooks b. [S185] Concord BMD, 135, Lucy Brooks b.
Findagrave.com, memorial #26920853. Photo by BobBoston. [S368] Vital Records of Medford, Massachusetts, To the Year 1850, 30, Ebenezer Brooks b. [S308] Thomas W. Baldwin, Vital Records of Cambridge, Massachusetts, To the Year 1850, 1:91, Ebenezer Brooks bp. [S363] Boston Marriages from 1700 to 1751, 200, Ebenezer Brooks/Hannah Gibson m.
[S368] Medford VR, 193, Ebenezer Brooks/Hannah Gibson m. Boston. [S368] Medford VR, 347, Hannah Brooks d.
[S881] Roger D. Joslyn, ed., Vital Records of Charlestown Massachusetts To the Year 1850, 1:401, Caezar (Brooks)/Zipporah (Brown) m.; 1:474, Caesar Pertsmouth/Zipporah. [S572] William Gray Brooks, 72. [S368] Medford VR, 349, ____, wid. Dea. Brooks d. (c.r., g.r.). [S493] Vital Records of Lynn, Massachusetts to the End of the Year 1849, 2:66, Ebenezer Broocks/Mrs. Elizebeth Mansfield m.
[S368] Medford VR, 347, Dea. 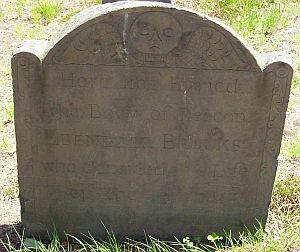 Ebenezer Brooks d.
[S368] Medford VR, 349, Wid. Dea. Brooks d. (c.r., g.r.). [S148] FindAGrave.com, memorials #26920853, #26920856, #26920920. [S368] Medford VR, 30, Hannah Brooks b. [S368] Medford VR, 31, Kathrine Brooks b. [S368] Medford VR, 30, Ebeneser Brooks b.; 347, Ebenezer d.
[S368] Medford VR, 31, Mahitteble Brooks b.; 348, Mehetabell d.
[S368] Medford VR, 30, Gibson Brooks b.; 347, d.
[S368] Medford VR, 32, Thomas Brooks b.; 349, d.
[S485] Vital Records of Scituate Massachusetts To the Year 1850, 1:51, Ebenezer Brooks bp. [S1334] Vital Records of Marblehead Massachusetts to the End of the Year 1849, 2:56, Ebenezer Brooks/Elizabeth Tomkins m.
[S106] NEHGS Register, "Descendants of John Stockbridge" (Oct 1979), 133:292. Findagrave.com, memorial #27560002. Photo by RD & ES. 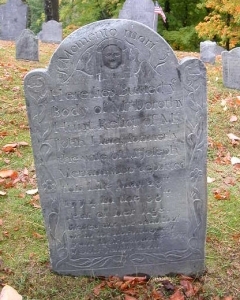 Sarah died 22 Feb 1775 (g.s. ), a. 845, and is interred with Ebenezer in Oak Street Burial Ground, Grafton.6,7 Of their eight children, two married Willard siblings and two married Drury siblings. [S185] Concord, Massachusetts Births, Marriages, and Deaths, 1635–1850, 33, Sarah Fletcher b.